Particle’s Next Generation Hardware @particle – Compatible with @adafruit Feather #Feather #FeatherEcosystem « Adafruit Industries – Makers, hackers, artists, designers and engineers! Introducing Particle’s Next Generation Hardware, Powered by Particle Mesh (blog post). And here is the press release, congrats Particle on the line up and of course Feather compatibility! SAN FRANCISCO — February 13, 2018 — Particle, the most widely used Internet of Things (IoT) platform, today announced Particle Mesh, its next generation hardware unlocking developer access to mesh networking technology. With Particle Mesh, networks can cover more ground and capture more data with higher reliability at a reduced cost – ultimately making IoT solutions more intelligent. This marks an important advance to help developers revolutionize industries from manufacturing and logistics to smart home devices, delivering on real IoT. Particle Mesh is uniquely built to solve the IoT issues many companies run into while building connected products. Historically, IoT devices connect directly to the cloud through cellular or Wi-Fi communication and depend on the cloud to relay messages between devices. This approach is not optimal for all use cases as it requires all devices to be Wi-Fi or LTE connected, which can create added cost, power demands and downtime. Particle Mesh enables developers to create local networks with low-cost, low-power devices that communicate with one another, then back to a single Wi-Fi or LTE connected gateway to the cloud. This also instills redundancy so if one endpoint fails the network automatically self-heals to the nearest device with no downtime or lost data. Particle is also continuing investment in open source standards alongside leading IoT partners in both hardware and software. 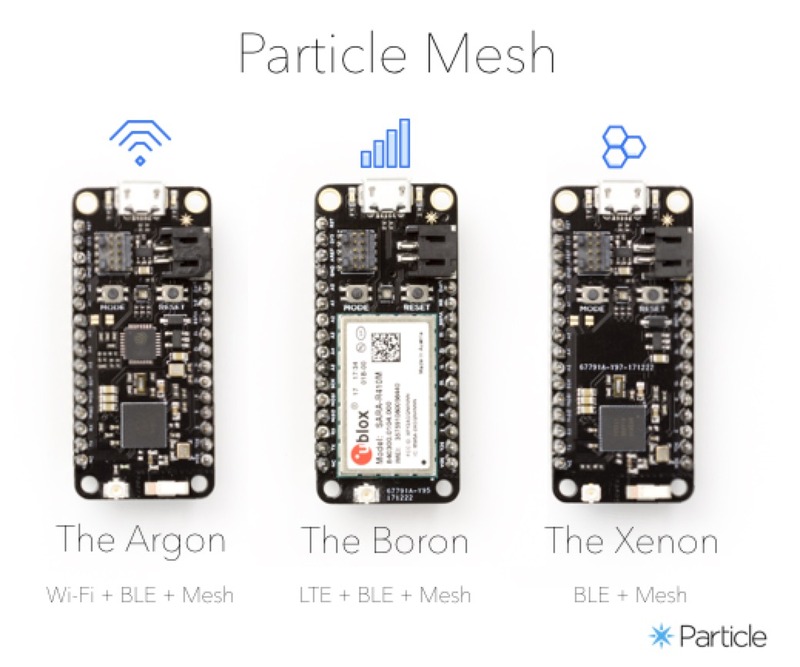 Particle Mesh capabilities are built on the industry-leading mesh networking technology OpenThread by Alphabet’s Nest Labs. The new portfolio of hardware is built to comply with Adafruit’s Feather form factor, providing compatibility with 50+ FeatherWing hardware accessories. 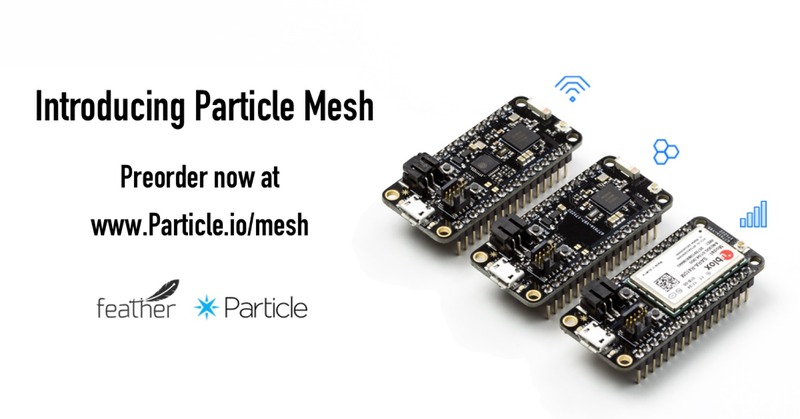 Particle Mesh development kits are completely open-sourced giving developers access to board layout and schematics. Finally, starting today Particle connectivity plans are now triple the data for the same price. For $2.99 per month, developers receive 3MB of data (LTE M1/NB1 and GSM) which includes access to the Particle Device Cloud. Would you be able to comment on the Xenon’s ability (or inability) to be used under either the Arduino or Nordic development environment? I assume it should be possible but the currently available information only mentions the Particle dev environment. It seems this board is positioned to be an upgrade to the Feather nRF52 but obviously its very early so I’m sure Adafruit or Particle may not want to share everything just yet so I understand if these details cannot be released at this time. They explicitly expose JTAG, and the esp32 in the current design is mostly a wifi copro as I understand it (originally was going to be an esp8285). Traditionally they’ve used a dfu capable bootloader as well, and provided instructions and some tools to run your own limited (by the example implementation only) particle cloud. Short answer: given their history and the current boards I expect programming the Nordic chip should be simple. You should probably go ask them on the particle.io forums about the esp32, though I imagine it’s hooked up so that, at the very least, the Nordic can program it for firmware upgrades.